Engage: Rotator is our DotNetNuke module for displaying multiple pieces of content in the same area of your site with beautiful timed transitions between the content. The module uses our templating system, so all of the markup is generated based on a provided template. 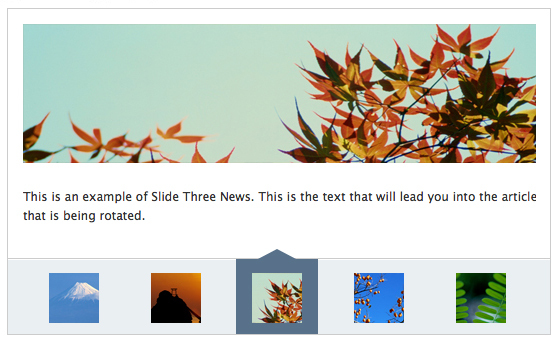 This allows to extreme flexibility for you in designing the display and layout of your content slides. However, creating a completely new template requires some knowledge of HTML and CSS, which is a barrier to many people who just want to buy the module and have it look great for their site. Having more templates also means more starting points to create your own customized template for your site, without having to start completely from scratch. We really think that these designs will be appealing to your site's visitors, and can help to create a first impression that is confident and well put-together. In addition to the templates, the 2.1 release also features some small fixes to the module, so you might want to take a look at upgrading even if you're happy with the template that you have. We hope that these templates fit your needs. Please leave a comment here or on our forums if you love it, or if there's something else that you'd love to see Engage: Rotator provide for your site. If you don't have a copy, you can try it out.